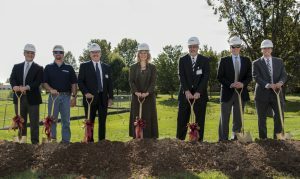 Benchmark Construction Breaks Ground for New Memory Care Residences - Benchmark Construction Company, Inc.
LANCASTER, PA – Benchmark Construction Company, Inc. of Brownstown, PA broke ground recently on the construction of the new Memory Care Residence at Cross Keys Village in New Oxford, PA. This new 31,241 square foot memory care residence facility has an approximate project value of $8,000,000 and will provide accommodations for 32 residents who are in early and middle stages of memory loss. This “small house” model is designed as two separate households consisting of 16 residents with spaces allocated for living, dining, cooking and a garden. The two households will be joined by a central service core consisting of supportive spaces and a kitchen. A semi-public area providing bistro style seating, a salon and store connects the two households to the main entrance. “This will be the first of this type in our region and we are excited to partner with Benchmark Construction on this important venture, which will serve not only the Cross Keys Village community, but the greater region of Adams and York counties and beyond” states Joy Bodnar, Chief Operating Officer, Cross Keys Village. Benchmark has named Eric Robertson as the Project Manager and William Lastinger as the Project Superintendent.Benchmark Construction Company, Inc. is an award-winning, full-service commercial and institutional construction firm with a focus on Senior Living, Healthcare, Higher Education and Commercial/Specialty markets. We offer general construction, preconstruction, construction management and design-build services to the Pennsylvania, Maryland and Delaware regions.